If you want to maximize productivity then at minimum your organization should have a lead or team for all 3 to create clear ownership and focus. Sales Management should not be a catch-all; and Sales Enablement is not Sales Operations. A sales manager is not a sales leader. To be an effective sales leader, you must first understand the various roles to play; a leader, a coach, a mentor, and a manager. The goal is not to master these specific roles; the goal is to get out of constant managerial mode, and learn WHEN and HOW to pivot your approach and get the most out of your sales folks. This is about digging deep and introducing dynamic leadership skills in addition to the fundamental ones you’ve established. Pushing yourself to develop your capabilities even further and challenging your leadership boundaries. The goal is not to master these specific roles either; the goal is to learn HOW and WHEN to be a transformational leader amongst your PEERS and COLLEAGUES. Sales stigma is a real thing: it is the stereotypical perception of the categorization and association of sales people with negativity. It will stifle the growth of your business in more than one way. Avoiding or eliminating it is a TWO WAY street with ownership of both the sales team and the rest of the business. This can also be the beginning of a cultural transformation – embrace it. I’m going to keep this short and sweet, but if you need a refresher on where we’re at start here first and read through. 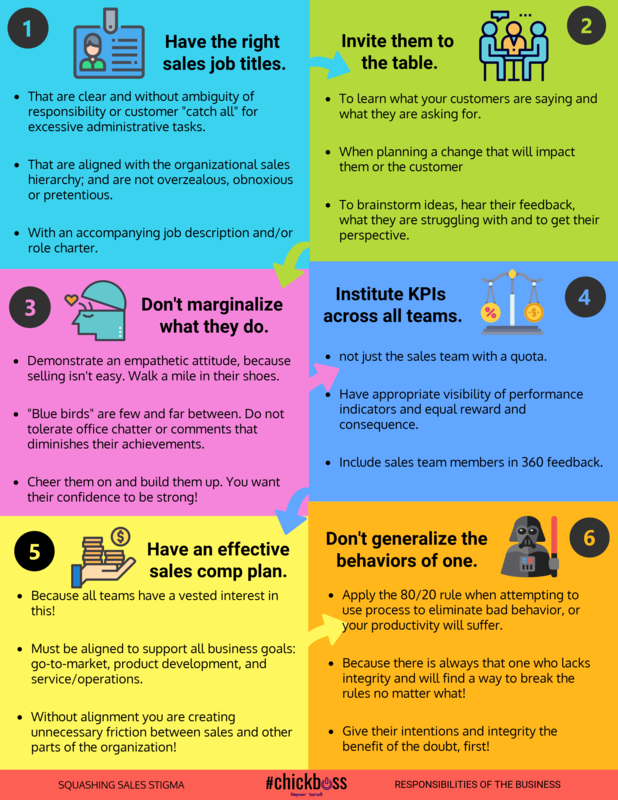 Side bar, I would love to hear from some critics, sales folks or not on this next infographic, or even the last one. I always appreciate the likes, clicks, and kudo texts (thank you)… but I rarely (never) hear from people disagree with my ramblings, and while I’d love to think I’m just that good – I know I’m not. 🙂 So please… by all means, don’t hold back… there is always something to be learned from someone else’s perspective.  All my fellow sales peeps… you’re up! Without any further ado, here are 6 things you are responsible for to avoid that stigma and turn around that stereotype. Hopefully you’ve had the chance to read the intro post to this topic and you’re ready to get started. As mentioned, we’ll cover two sides of ownership to squash or avoid sales stigma negativity in an organization: the business “your” ownership and the sales ownership. If it’s not immediately obvious why I’ve broken it down this way, I’ll explain. It takes an effort from both sides, sales stigma doesn’t just come to be, there is always an underlying reason for the negative perception; usually it is some bad experience another team or individual has been through and they’re carrying it around like baggage. Just like a bad relationship. You’ve got to let go of whatever it is your carrying around or it will just get worse. I’m not trying to be mellow dramatic about this topic yall, but sales stigma and negative sales stereotypes are only hindering the success of the business and your own professional growth. Do you really need one more thing getting in the way of either of those things? I’d guess probably not. If you think this isn’t actually a thing or an issue, then unfortunately you are probably a part of the problem. Just saying. 😀 But…fear no more because today is your lucky day and we’re going to fix that by starting with YOU! No matter what role you’re in, team you are on, or where you sit in the hiearchy – there is at least one or several of these accountability areas you can impact! So let go of that baggage, stop making excuses, and be a part of the change instead of the problem! Negative organizational sales stigma is a real thing, one that should not be ignored. Quota bearing, commission based sales easily comes with preconceived generalized character; used car salesman, slimy, greasy, out to make a buck, sales monkey, etc. I can tell you, from experience that this is actually a thing, but I didn’t believe it until I made the transition from a salary role to a quota carrying, commission based role. When I was actually living the reality of it, I was surprised, but also disappointed. In the meantime, check out Peter’s articles, process what he’s saying and we’ll go from there. In the last topic, our guest author and professional coach, Lindsey Hood talked about the various roles that an effective sales leader has, and when to pivot between them. In the second part of this topic I want to expand on these roles and transition you from an effective sales leader to a transformational one. Lindsey’s insights are the foundational roles of effective sales leadership. A Leader, Manager, Mentor, and Coach are all critical to success as a sales leader, and as she mentioned it’s difficult to get it right 100% of the time but without working towards them you’re simply a quota carrying people manager. A successful sales individual can emerge to a successful sales manager, but it takes more than instituting selling strategies and hitting quota goals to be an effective sales leader; and even more to expand that to a transformational one. Effective, transformational leaders must step out of the frame and see the entire picture (yes, I said it again) and recognize that before they are able to even attempt doing it. This is often extremely difficult in the sales world; with the natural emphasis of sales targets as the measure of success it is easy to become hyper focused on this alone; but this is the difference in taking a sales team from good to great with long-term success. What’s your Sales Leadership style? As mentioned in the introductory post of this 2 part blog, as a sales leader you have many hats to wear. To be an effective and successful sales leader I believe you need strong communication and interpersonal skills, and be able to know when to move between being leader, manager, mentor and coach for your team. There is often overlap, and the terms are sometimes used (incorrectly, in my opinion) interchangeable – so, what are the hats that make for an effective sales leader, and when do you need to use each of these skills? I believe leadership is about selling the direction of the company and your team, whether that is the long-term strategy, or the shorter term tactics that need to be deployed – the ‘why’ behind the ‘what’ and ‘how’ of management, if you like. It isn’t just about giving the inspiring speech though, and ensuring everyone understands the message, it is also about ensuring your actions are aligned to the messages you are delivering. If, for example, the strategic direction of the company is to offer fair and honest pricing to customers, you need to ensure that your decisions with your team support this, and not allow for that ‘one case’, where you know you can get away with a higher margin, to happen. 2. It is okay for me to bad mouth my colleagues, and you. There are many management styles and depending on several factors, including urgency, prescriptiveness of output, and experience of the team, will mean you will need to deploy the style most appropriate for the situation. For example, a new member of staff may need very explicit instructions of what to do to give them the confidence to progress a deal; an experienced member of staff may just need to know the output you desire and timescale and you know they will work to this and you just need to be on hand to remove any roadblocks for them. If the board have given a very prescriptive output, such as an executive sponsorship report structure, you need to communicate this to the team and ensure they are sticking to this – there is no room for their interpretation. A mistake is sometimes not wanting to be seen as a ‘micro manager’ and then not checking in with your staff on progress. The risk is, without regular checkpoints, they wait too long to tell you about a concern because they want to sort things out for themselves. This is great and empowering to a point, but your role as a manager is to manage the task so it is your role to know where your team is at, and to support in moving things along to ensure successful completion by the agreed deadline. Let your team know from the outset the expectations – for example – that they own getting that deal over the line, but you will expect daily updates [state if this is in writing, or verbally], that you want to know if there are any roadblocks that they haven’t been able to remove within 24 hours of identifying, that your role is to ensure this is delivered to time and budget/margin, and their role is to make this happen! Mentoring and managing can get confused. As a mentor you are sharing your experiences so the individual can get the view of how you did something, getting an understanding from your experience of what worked for you, and decide if this is how they could also approach the situation; managing is ensuring the task is done, and it may be that it has to be very prescriptive in the direction given. This means you may have experience to impart, so the lines may blur, or it may be that it isn’t a learning opportunity for someone to get insights into your experiences, and it is imperative they ‘just do it’. This is why it is often easier to mentor individuals outside of your direct reporting line. You can be more objective, and individuals are never confused as to the role you are taking and if they have to follow your experience or if it is purely a suggestion. can elicit further dialogue and help someone find different answers themselves, empowering them to implement a strategy that they have developed and could work for them. I would suggest using coaching when you want the individual to find their own answers. If you are really wanting the individual to do something differently, but your way, mentoring or managing styles may be better styles to adopt. I think all of these roles have their place and the skill as a sales leader comes in knowing the appropriate time to be utilising each of the roles. As a coach, I know the power of coaching. As a manager, I always preferred using a coaching style as, although I am a control freak by nature, I accepted that my way wasn’t necessarily the best way of doing something, so I would prefer to give my team the expectations of the end results and let them find their own way. If they struggled with this, I would give my opinion and/or facilitate a brainstorming session, however, I know there were times I should have been more managerial and given a more prescriptive way of doing something, to avoid some mistakes or missed deadlines. Hindsight is a wonderful thing, but I do think it is important to reflect and take the learnings for your own future development. I don’t think anyone gets it ‘right’ 100% of the time; we are all a work in progress and doing the best we can. Having the skills is one thing, knowing the theory is great, but the application is where the real learning happens and where you get to hone and develop your own sales leadership styles. Embrace the process, keep being open to feedback and learning, and you will keep improving as a sales leader. As a sales leader you have many hats to wear, both internal facing to your team, external facing to the business and also your customers. You are leading, supervising and managing your team to hit the sales number and other business objectives; you are developing and implementing the sales plans and evaluating and managing performance of your teams against this; you are developing and motivating your teams to achieve (and exceed) revenue goals; you are responsible for their understanding on the direction of the company and the role they play in this as a team, and as individuals. You are also accountable for collaborating with stakeholders within the business so that sales requirements and challenges are understood. Working both cross-functionally and with other sales leaders to ensure the sales strategies and methodologies are aligned to the overall business objectives, and there is full support of the sales strategy from the business. Like many leadership roles, that of a sales leader is no easy task. A very successful sales individual isn’t the only thing that makes a successful sales leader. I often see a lot of emphasis put on one’s ‘selling track record’ to define their ability to be a successful sales leader; unintentionally forgetting about all the other hats this individual has to put on, and their leadership aptitude for doing so. You must be able to recognize when to pivot between these leadership hats, and how to do so effectively. You are not only doing this with your team members and customers, you are doing it with your sales leadership peers, departmental colleagues, and superiors. This is the difference between a sales leader that is good, one that is great, and one that is world-class. I am thrilled to announce that I have invited Lindsey Hood, professional coach, to join in on our discussion as a guest blogger and share her insights!! Tomorrow, Lindsey will kick it off and share her perspective on the roles of an effective sales leader – so stick around, share your thoughts and welcome her! Like most of us, I’m a sucker for a good meme! I mean, where did we ever find humor before the YouTube, GIF, and meme days?! Who knows! The “what I really do” meme is one of my favorites. I searched and searched for an accurate representation of a “what I really do” sales management meme, and although there are some funny ones out there, there wasn’t one that I felt captured all perceptions from my view point accurately. So, I generated one myself… of course! 🙂 Are you down for a meme generator competition?! Keep reading! If the template had more boxes, I would have added a prospect one, with the funny image of jaws jumping out of the ocean with the kill in it’s mouth! If I could have split the last “What I really do” image into several images, I would have also included these along with the barrier buster image shown! As a prequel to the next topic in the series, I wanted to share this meme to get you thinking first. Some of you may look at it and chuckle… nodding and thinking to yourself, “yep, that’s pretty accurate!” Some of you may look at it with an entirely different or slightly varying perspective. While others may look at it and laugh, because they don’t have an opinion one way or the other. From your perspective of what sales managers do, what does this meme mean to you? Do you agree with all the various perceptions of the images, just a few or none at all? If you could change any part of the meme images or personas, what would you change them to and why? EXTRA CREDIT: If you’re feeling really ambitious, create your own and share it in the comments! It can be of ANY role, or using the sales management them. 🙂 *Note, you may have to screen or snippet the final meme if your link doesn’t work! I’ll give everyone a few days to think about it and participate, and then we’ll jump on in.